with pure citrus botanical essences to uplift and strengthen. Enhanced with the active benefits of aromatherapy pure essential oils and Australian native extracts. Mayella ® Vitamin C Lift Serum has been formulated containing certified organic and bio-active botanicals. A vegan, 100% plantbased daily vitamin serum that is suitable for all skin types, women, men and teens. 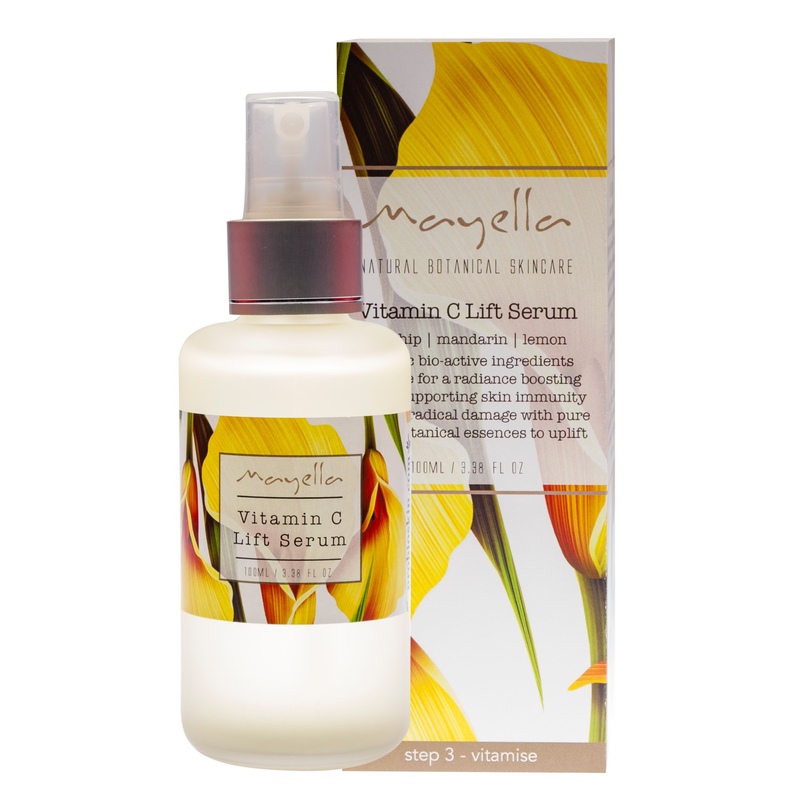 Mayella ® Vitamin C Lift Serum is a beautiful, highly absorbent serum for a super immune and radiance boost to the skin. Purposely formulated with the intention of being actively involved in antioxidant repair and offering protection to epithelial cells against free radical damage. Formulated with vitamin rich pure cold pressed rosehips, Australian native extracts, uplifting and energising citrus aromatherapy pure essential oils for their antiviral and antibacterial clearing properties and our heroine ingredient – antioxidant powerhouse Olivane ™. Vitamin C, derived from berries and the Australian native Kakadu plant, is bio active and highly bio available. Kakadu plum is acknowledged worldwide and widely respected as the most potent source of bioavailable Vitamin C. This means in essence that the total ingredients delivered to your skin are totally available and actively ready to be utilised by the skin cells. Applied topically for direct absorption stimulates the skin functions of repair, growth of cells and blood vessels and a proactive approach to the prevention of free radical damage. Free radicals flourish with Blue light and UV radiation and importantly the consequences of long term sun exposure. UV radiation has been researched extensively, and proven many times over to be responsible for the formation of free radicals, oxidative and cellular DNA damage. The presence of Vitamin C in the skin and its ability to improve wound healing by stimulating the fibroblasts into activity, leads to the skin having a focus of repair around potentially mutagenic or cancerous, DNA lesions. Free radicals have been connected through research to lead to premature ageing, preventable through the use in diet and skin care of antioxidants such as Vitamin C. Mayella ® Vitamin C Lift Serum is powerful in the defence of and repair against free radical damage. Vitamin C presence is key in many vital enzyme activities, such as stimulating the synthesis of the protein collagen and elastin. So the topical application of Mayella® Vitamin C Lift Serum formulated with a potent and natural source of Vitamin C and harmoniously blended with citrus aromatherapy pure essential oils, support this vital activity of collagen and elastin synthesis. This involvement of Vitamin C with collagen synthesis also makes Mayella ® Vitamin C Lift Serum a perfect support formula for healing of scarring as with post acne skin, for pre and post surgery and/or cosmetic procedure. Wound healing is particularly effective with the presence of Vitamin C in the skin matrix. With skin sensitivity and redness caused by flushing or fine capillary damage, daily use of Mayella® Vitamin C Lift Serum will help reduce inflammation and sensitivity. This is a perfect antioxidant serum to use with Mayella ® Vitamin B Lotion after sun exposure to help calm the skin and any resulting sunburn, and importantly to initiate repair from UV radiation and related environmental insults. Inflammatory skin conditions such as Rosacea, pigmentation, blemishes and break out will benefit greatly by using Mayella ® Vitamin C Lift Serum as will skin that flushes easily with exercise, heat exposure (computer screens, central heating), or physical exertion. Shake bottle well and disperse 1–2 sprays of Vitamin C Lift Serum onto clean dry hands. Press serum onto your whole face and neck, massaging in gently with an upward outward circular motion and concentrating on main areas of concern. Apply multiple times throughout the day for intense treatment and defence of free radical damage from long air flights, significant UV exposure or sunburn. Face and neck will be left feeling revived, lifted and ready for Step 4 – Nourish.